BRIGHTON, Mich. - You may have been hearing A LOT about the all-new F-150 from Ford and for a good reason because the exciting 2016 F-150 continues to dominate the truck industry! With a Pro Trailer Backup Assist making backing up a trailer as easy as turning a knob, more and more people are realizing the affordability and dependability that a Ford F-150 can provide. With a new Special Edition Appearance package available on the XLT and Lariat, Ford is continuing to make tons of different options available on America's favorite pickup truck. 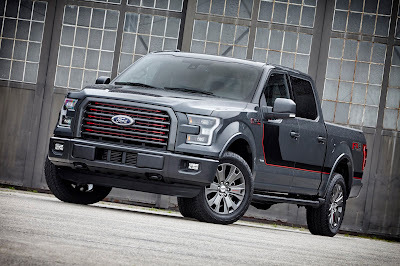 Other changes for the 2016 F-150 include SYNC 3 integration, which replaces SYNC with MyFordTouch, Shadow Black replacing Tuxedo Black, Lithium Gray replacing Guard Metallic and 20-inch machined aluminum wheels with painted silver pockets available on the XL. The All-Pro Back Trailer, however, is what makes this new 2016 model! There is a reason the exciting 2016 F-150 continues to dominate the truck industry. The segment-first technology feature allows customers and drivers of all skill levels to steer a trailer instinctively by turning a knob left or right to indicate direction; the truck controls its steering and limits vehicle speed. Also, responding to past customer requests, the 2016 Ford F-150 with the 5.0-liter V-8 engine will offer a gaseous-fuel prep option, making it the only light-duty pickup capable of running on compressed natural gas or propane. We will definitely keep you updated as to when the 2016 F-150 will roll into Brighton Ford, hopefully very soon! Until then, feel free to stop by and visit your Milford Area Ford Dealership today! Brighton Ford is located at 8240 Grand River Ave. just north of I-96 in Brighton. We are a family owned and operated business that strives for customer satisfaction. For more information on Brighton Ford visit BrightonFord.com or give us a call at (800) 836-8206.